extreme bandwidth efficiency. 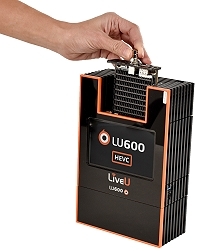 LiveU is adopting the HEVC standard across its entire product portfolio from its smallest uplink units to hybrid truck solutions, delivering the highest compression and lowest power consumption. •	‘Live & Store’, allowing broadcasters to go live under any network conditions while simultaneously saving a high-quality copy of the live video for future purposes.